You have made a wise choice – now protect that investment. Keep peace of mind during your ownership experience by choosing from these Protection Products. Click below to learn more about first class options to enhance your Mercedes-Benz vehicles. First Class Wheel and Tire Protection Plus will not only help cover the cost to replace your wheels and tires if they are damaged by a covered road hazard, it will even cover the cost to repair eligible scrapes, scratches and other cosmetic wheel damage. It’s a feeling of security you won’t want to do without. Deductibles for covered road hazard replacement claims and aggregate claim limits may apply depending on the plan and the dealership from which you purchase coverage. For a description of applicable deductibles and any claim limits on the number of covered replacement, see your Mercedes-Benz dealer. Ask us about First Class Wheel and Tire Protection Plus today. 1 Repairs performed at any other entity than a participating authorized Mercedes-Benz Dealership may require payment at the time of repair service by the customer and then submission for reimbursement to the Administrator. 2 Additional exclusions may apply. Repairs require prior authorization. Please see your First Class Premium Protection Agreement or First Class Wheel and Tire Protection Plus Agreement for specific coverage details, limitations, and a complete list of exclusions. This website provides general information about the optional First Class Wheel and Tire Protection Plus product and should not be solely relied upon when purchasing coverage. Please refer to your product Agreement for details of terms, conditions, and specific coverage details, including limitations, exclusions, transferability and cancelability. Coverage may vary by state. This product may not be available in all states or for all vehicle models. This product is available at the time of vehicle sale or lease only. Please see your dealer for more information. This is an optional product marketed through Mercedes-Benz Financial Services. The Administrator/Obligor offering the First Class Wheel and Tire Protection Plus product is Safe-Guard Products International LLC, Two Concourse Parkway, Suite 500, Atlanta, GA, toll-free number: 1-866-406-1315, except in Florida where the Administrator/Obligor of First Class Wheel and Tire Protection Plus is Safe-Guard Warranty Corporation, Florida License Number 60126, Two Concourse Parkway, Suite 500, Atlanta, GA, toll-free number: 1-866-406-1315. At Mercedes-Benz Financial Services, we want to ensure that your lease experience is simple and predictable. With First Class Lease Protection, you gain peace of mind knowing you have coverage for certain damage expenses that go beyond normal wear and use-for a smoother lease-end process. First Class Lease Protection (FCLP) provides coverage at lease end for some chargeable items, such as minor dents, scratches, and certain damage that go beyond normal wear and use. The cost of FCLP can be added to your monthly payment, when you sign your Mercedes-Benz Financial Services First Class Lease agreement. FCLP will waive specified excess wear and use charges up to a maximum limit of $7,500. 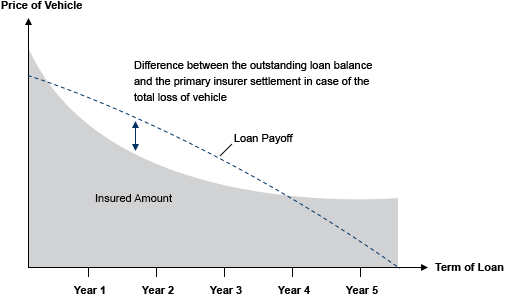 This includes excess wear and use amounts on covered single events up to a maximum limit of $2,000 each. It also covers windshield damage charges, missing parts and equipment charges up to $200 per part, and the charge of one missing key fob. Plus with FCLP, there is no deductible. This product does not cover any excess mileage charges, and may not waive the entire balance owed on your lease agreement. * This includes excess wear and use amounts on covered single incidents that are less than $2,000 each and covers missing equipment up to $200. Plus with FCLP, there is zero deductible. This product does not cover any excess mileage charges, and may not waive the entire balance owed on your lease agreement. You will have the assurance of knowing your vehicle has extra protection during the entire life of your lease. Eligible charges for minor dents, scratches, and certain types of damage considered beyond normal wear and use will be waived, minimizing the out-of-pocket expense for you at lease end. This is intended as a general description of First Class Lease Protection. Certain exclusions apply. This is an optional product that does not cover any excess mileage charges and may not waive all of your excess wear and use charges. There may be amounts for which you remain responsible at lease end. First Class Lease Protection may not be available in all states or for all vehicle models. This product is only available at the time of the vehicle lease. Please see your dealer for more information and refer to the First Class Lease Protection Addendum for complete details and exclusions. We know you want to maintain your vehicle’s great style and condition. That’s why we offer First Class Paintless Dent Repair to help cover the costs to repair certain minor dents and/or dings without affecting the original factory finish. It’s a quick and easy process that will have you back on the road in no time. The Administrator/Obligor is Safe-Guard Products International, LLC, except in Florida where the Administrator/Obligor is Safe-Guard Warranty Corporation. Maintaining the value and beauty of your vehicle is easy with First Class Paintless Dent Repair. With your convenience in mind, service can be performed at a participating Mercedes-Benz Dealership or other authorized repair facility, at your home, or at your place of business. Ask us about First Class Paintless Dent Repair today. 1Additional exclusions may apply. Please see your First Class Premium Protection Agreement for details of terms, conditions, and specific coverage details, including limitations, exclusions, transferability and cancelability. Available on New, Certified Pre-Owned, and Pre-Owned Mercedes-Benz vehicles. All transactions related to the optional First Class Paintless Dent Repair product are governed solely by the provisions of the Agreement. This brochure provides general information about the optional First Class Paintless Dent Repair product and should not be solely relied upon when purchasing coverage. Coverage may vary by state. This product may not be available in all states. This product is available at the time of vehicle sale or lease only. Please see your Mercedes-Benz dealer for more information. This is an optional product marketed through Mercedes-Benz Financial Services. 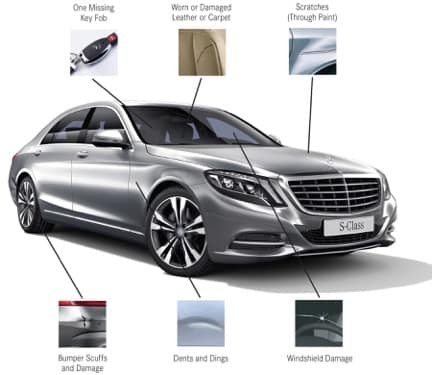 The Administrator/Obligor of the First Class Paintless Dent Repair product is Safe-Guard Products International LLC, Two Concourse Parkway, Suite 500, Atlanta, GA, Toll-free number:1-866-406-1315, except in Florida where the Administrator/Obligor of First Class Paintless Dent Repair is Safe-Guard Warranty Corporation, Florida License Number 60126, Two Concourse Parkway, Suite 500, Atlanta, GA, Toll-free number: 1-866-406-1315. A perfect view starts with your windshield. When cracks, stars, chips, and other damage caused by road hazards and debris harm your windshield, First Class Windshield Protection preserves your vehicle’s visibility. First Class Windshield Protection helps cover the costs associated with the replacement of a front windshield to ensure a clear view of the road ahead. It’s easy to see the benefits. Maintain the best view possible with First Class Windshield Protection–great coverage with your convenience in mind. With your convenience in mind, service can be performed at an authorized Mercedes-Benz Dealership or other authorized repair facility, at your home, or at your place of business. Ask us about First Class Windshield Protection today. 1 First Class Windshield Protection is not available in Florida, Georgia, Maine, New York, Texas and Wyoming. 2 Unless $5,000 maximum aggregate claim limit has been reached. 3 Additional exclusions may apply. Please see your First Class Premium Protection Agreement for specific coverage details including limitations, and a complete list of exclusions. This website provides general information about the optional First Class Windshield Protection product and should not be solely relied upon when purchasing coverage. Please refer to your Agreement for details of terms, conditions, and specific coverage details, including limitations, exclusions, transferability and cancelability. Coverage may vary by state. This product is available at the time of vehicle sale or lease only. Please see your dealer for more information. This is an optional product marketed through Mercedes-Benz Financial Services. The Administrator/Obligor of the First Class Windshield Protection product is Safe-Guard Products International LLC, Two Concourse Parkway, Suite 500, Atlanta, GA, Toll-free number: 1-866-406-1315. Your Mercedes-Benz key has important technology and features that make it costly to replace. First Class Key Protection provides security and peace of mind in the event that your keys are lost, damaged, or stolen. The Administrator/Obligor is SafeRide Motor Club, Inc. Ask us about First Class Key Protection. 1 Additional exclusions may apply. Please see your First Class Premium Protection Agreement for specific coverage details, limitations and a complete list of exclusions. This website provides general information about the optional First Class Key Protection product and should not be solely relied upon when purchasing coverage. Please refer to your product agreement for details of terms, conditions, and specific coverage details, including limitations, exclusions, transferability and cancelability. Coverage may vary by state. The Key Protection member must demonstrate proof of residence and be present for home lockout services. This product may not be available in all states or for all vehicle models. This product is available at the time of vehicle sale or lease only. Please see your dealer for more information. This is an optional product marketed through Mercedes-Benz Financial Services. The Administrator/Obligor offering the First Class Key Protection Product is SafeRide Motor Club, Inc., SafeRide Motor Club, 13901 Midway Road, Suite 102-429, Dallas, TX 75244-4388. Each year millions of vehicles are totaled in events such as collisions, thefts, or natural disasters. In many cases, the insurance settlement does not cover the loan payoff. The First Class Guaranteed Auto Protection (GAP) plan available through Mercedes-Benz Financial Services s an optional product you may purchase to help provide a level of financial protection if you find yourself in that situation. When you choose First Class GAP, the plan fee can be added to your monthly vehicle payment. If your Mercedes-Benz vehicle is stolen or declared a total loss in an accident, there can be a significant difference between the amount your insurance company will cover and the balance owed to Mercedes-Benz Financial Services. First Class Guaranteed Auto Protection helps cover this difference, and with it you may also be reimbursed for the out-of-pocket cost of your insurance deductible, up to $1,000 where allowable by state law. Consider this scenario: You purchase a $60,000 Mercedes-Benz vehicle. Seven months later, you get into an accident that totals your car. Scenario and graph are for informational purposes only. There may be portions of the finance contract for which you remain responsible. See your GAP agreement for details. Ask us about First Class Guaranteed Auto Protection today. This is intended as a general description for Guaranteed Auto Protection. GAP is an optional product which may not waive the entire balance owed on your finance contract. The GAP amounts may vary by state and there may be amounts for which you remain liable, such as late charges, past due amounts, and other fees. GAP does not apply to a vehicle used for commercial purposes, or loss or damage due to fraud or illegal acts, intentional damage, legal confiscation or repossession of the vehicle. GAP may not be available in all states or for all vehicle models. This product is available at the time of vehicle sale only. GAP is a product of and administered by individual member companies of Zurich in North America, and is marketed through Mercedes-Benz Financial Services. Please see your dealer for more information and refer to the First Class Guaranteed Auto Protection Agreement for details and exclusions. Mercedes-Benz Financial Services now offers an enhanced level of protection — First Class Interior and Exterior Protection — using DuPont™ products. A protective coating is applied to the carpet, fabric, leather, and paint, helping to safeguard your vehicle against stains and marks, while maintaining your vehicle’s overall appearance. Extra care. Inside and out. You want your vehicle’s carpet, fabric, leather, and paint to maintain its incredible look and feel. First Class Interior and Exterior Protection with DuPont™ protective coating helps preserve your vehicle’s carpet, fabric, leather, and paint against the normal wear and use that happens over time. Carpet and upholstery fabric are exposed to spills, splatters, and everyday mishaps. DuPont™ Interior Protection will help provide protection against staining, high temperatures, and discoloration. It is designed to make it easier to clean up spills and splatters, and extends the life of your vehicle’s brand new interior1. Though tough in its own right, leather surfaces are still vulnerable to soiling and staining. DuPont™ Interior Protection helps to prevent fading, discoloration and cracking of the interior finish by acting as a barrier to help keep mishaps from penetrating the surface1. Oxidation from sun damage, bird droppings, water spotting, insects and tree sap are just a few of the adverse effects that can damage your exterior vehicle finish. DuPont™ Exterior Protection helps to maintain the beautiful high-gloss finish of your vehicle’s exterior. Once applied, you can easily remove insects or debris that has landed on your vehicle. Additionally, your new alloy wheels will be protected from brake dust penetration and your exterior headlights from yellowing or clouding1. Keep your Mercedes-Benz looking newer, longer. Ask us about First Class Interior and Exterior Protection today. 1 Coverage does not guarantee the carpet, paint, fabric, or leather, alloy wheel or exterior headlight will, in all cases, be restored to its original condition. Not all types of damage are covered; for example, damage caused by certain common household substances is not covered. Coverage does not apply to theft, vandalism, fire, collision, rust, chipping or flaking paint, rips, tears, burns, punctures, damage due to corrosive materials, headliners or convertible tops. For stains caused by dyes or ink, remedy will be cleaning and professional redying of affected area. Remedy for exterior headlight is professional reconditioning only. 2 New vehicle limited warranty includes professional reconditioning, repair or replacement of the subject surface. Pre-Owned vehicle limited warranty is limited to professional reconditioning and for repair only. 3 Warranty transferable to one retail owner for the remainder of the term at no additional cost. Transferred warranty will include professional reconditioning only. DuPont™ is a trademark or registered trademark of E.I. du Pont de Nemours and Company or its affiliates and used under license by Advantage Product Pipeline, LLC. This is an optional product marketed through Mercedes-Benz Financial Services, and offered and administered by Advantage Product Pipeline, LLC. Please see your dealer for more information and refer to the Limited Warranty for the DuPont™ Automotive Protection Package for further details, coverage limitations, and exclusions. Unsurpassed service and value for miles to come. Options that work for you. 1All G models not applicable to above charts. Please see the maintenance booklet for service coverage. 3Wiper blade sets are recommended services, but not required. Making sure your vehicle continues to run like new is easy when you choose to go to a Mercedes-Benz dealership for service. Each of our service departments are staffed by expertly trained technicians who go above and beyond to provide the highest level of attention and care. Ask your Mercedes-Benz dealer about Mercedes-Benz Premier Prepaid Maintenance today or for details, exclusions, and limitations, visit mbusa.com or call 1-800-FOR-MERCEDES. 1 Savings may vary by dealer and model. 2 Additional maintenance may be required according to your driving habits, mileage and local environment. 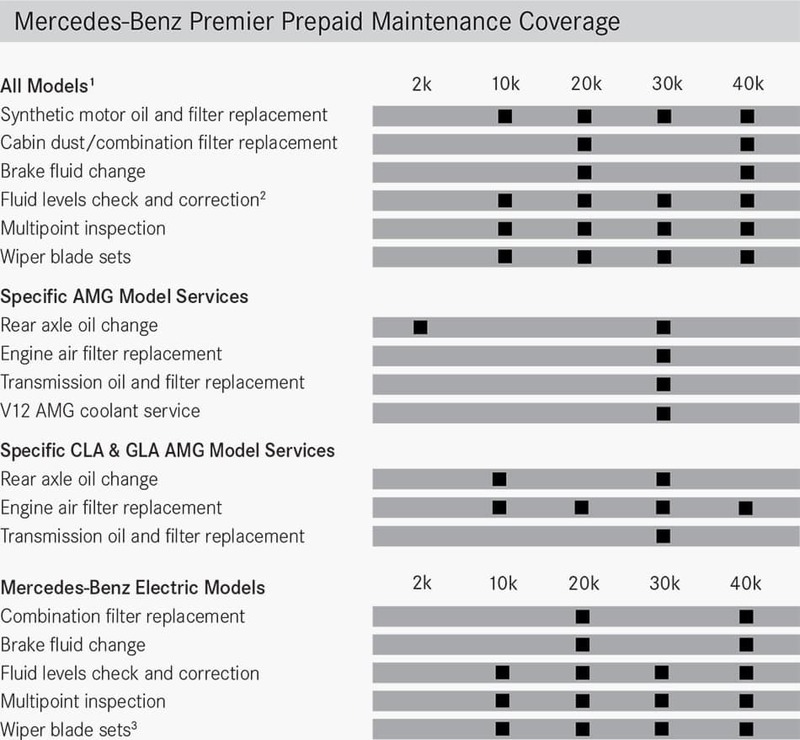 Mercedes-Benz Premier Prepaid Maintenance is available for all models except Maybach, SLR, and SLS. 3 This website provides general information about the optional Premier Prepaid Maintenance product and should not be solely relied upon when purchasing coverage. Please refer to your Premier Prepaid Maintenance agreement for details of terms, conditions, and specific coverage details, including limitations, exclusions, transferability and cancelability. Agreement cannot be cancelled and is non-refundable, subject to any limitations under state law. Coverage may vary by state. This product may not be available for all vehicle models. Please see your dealer for more information. Product offered and administered by Mercedes-Benz USA, LLC, and marketed by Mercedes-Benz Financial Services. The details are subject to change. *Price advertised for Service A/Service B includes all factory-required components. Please refer to your maintenance booklet for the complete list of factory-required services and details on the specific intervals for your vehicle’s year and model.